We got to 14 for the game on Monday night at Macpherson, but a steady trickle of withdrawals on the day of the game saw us left with 10, despite finding several replacements. The game was cancelled in the end. Everyone who has pulled out since 4 pm would usually have a penalty. I won't do the penalty this week, as it's a public holiday, but those who pull out after 4 pm will not be allowed to put their name down in the first 48 hours for next week's game. Sorry Eddie. Unfortunate when players put their names down without sufficient commitment to play. It is very frustrating when a game fills up early on, and we even have several players on waitlist, but a series of withdrawals in the last 24 hours leaves us short of players. As set out earlier in this thread, this has happened a few times. This is especially so for the Monday night game, where if we have withdrawals that leave us with enough for 6-a-side, a few more withdraw because they don't want to play 6-a-side. There are also players who have informed that they only want to play 7-a-side, and not 6-a-side, at East Coast. The issue of only wanting to play with the maximum number, and not the minimum number has arisen again, both for the game today (Sunday) at The Grandstand, and for tomorrow (Monday) at East Coast. Please indicate against your name if your playing is contingent on having the maximum number. and I do not generally allow names put down contingently or based on a condition to take up places, as only wanting to play if the maximum number is reached does not deprive anyone else of a place, and allows a game that might otherwise not fill up to fill up, I will allow it, as set out above. However, players who only want to play with the maximum number have not been indicating as such against their name. From now on, if we get to 14 players, but players withdraw within 9 hours of the game, resulting in the game being cancelled, the players who withdraw will not be allowed to put their names down for the following week's game within the first 48 hours of the thread going up. This applies to players who withdraw because they do not want to play with the minimum number, unless they had earlier indicated it against their name. Since the start of August 2015, the games on Monday @ Macpherson and Wednesday @ Khalsa fill up fast, with several players on waitlist within the first 48 hours after the schedule thread goes. However, a steady trickle of withdrawals on the day of the game, sometimes starting the evening before, means we usually only have just enough. The Tuesday night game on a small pitch at The Grandstand resumed on 18 August 2015 and has been filling up well since then. On the other hand, we haven't had a Thursday night game at Khalsa since 18 August 2015. For 10 September 2015, the game was switched to the Friday afternoon at The Grandstand due to the public holiday for the general elections on 11 September 2015. The Friday game was cancelled in the end. Anyway, I've schedule a game at the Grandstand for Thursday evening. The question of playing with 3 teams over 2 hours had come up previously for the game on Wednesday, 2 September 2015, at Khalsa, when we got to 9 on waitlist within 36 hours. What was more disturbing on that occasion was that the Thursday night game at Khalsa was cancelled with only 5 names. Apart from these extreme examples, there is a general trend of players rushing for the more popular Wednesday game, while the Thursday game is a struggle to fill. If enough players kept an open mind, we'd find that both games were similar. However, I've given up trying to ask players to switch from oversubscribed games to games that are slow to fill up, as the responses are very poor. When prepayment was first introduced in November 2010, I considered using price to influence numbers between more popular games and less popular games. This was last discussed on the "Payments, credits, penalties & usage" thread on 18 May 2014 (see more generally here giffas.proboards.com/thread/1429/payments-credits-penalties-usage?q=demand). If within 48 hours of the schedule thread being put up, there are more than 4 players on waitlist, the price per player will be $1 more. If, however, by the time the payment information is put up, there are no players on waitlist, the price per player will return to the original. For each game that is charged $1 extra per player, a game that is struggling to fill up will be reduced by $1. If there is no game struggling to fill up not already subsidised, I will create an extra slot, with the price per player reduced by $1 for that game. However, if the game at East Coast on 24 September 2015 fills up, I will consider keeping the Thursday game at East Coast for October 2015, instead of implementing the above. $1 admin fee for withdrawals (a) less than 24 hours before the game or (b) after the team selector/captain poll goes up (whichever is later for that particular game). However, for each season (April to September, or October to March the following year), $1 will be waived from the first 6 times admin fees are imposed on a particular player. Therefore, only players who repeatedly withdraw less than 24 hours before the game will be affected. So far, only Calvin has used up all 6 waivers, and the $1 admin fee has not been imposed yet. Further, I have only been recording such withdrawals if they occur on the day of the game itself. It is, nevertheless, additional work for me. The bigger problem is that allowing a player to put up to 3 other GIFFA Players down in the first 48 hours means that certain players have standing arrangements between themselves where one of them automatically put names down for 3 others to "chope" places for more popular games, and then leave it to those other players to withdraw if they subsequently find they can't make it. This has been discussed earlier on this thread. It is ok if these players are sufficiently committed to play, and withdraw early enough if they can't make it, but it is a headache for me if they think to withdraw only on the day of the game, because sometimes, even if there were players on waitlist or available, these other players may no longer be available by that time. Withdrawing less than 5 hours before a game carries a penalty. However, instead of monitoring withdrawals on the day of the game over each 6 month period, it may be simpler to require those who do so, and wish to play in the same game over the next two weeks, to put their own name down if they wish to have their name added within the first 48 hours of the schedule thread going up. Therefore, no one else can put their name down for them in the first 48 hours, and they have to do so themselves. If they want to keep the privilege of having another player put their name down for them during that time, they have to pay a $1 admin fee, and have sufficient credit to cover the admin fee. The Monday night games at Macpherson. The Wednesday night games at Khalsa. The Sunday evening game at The Grandstand. However, with a lot of withdrawals in the 24 hours before the game, most of the players on waitlist for the Monday and Wednesday games do get in. Saturday evening game at The Grandstand. Tuesday night on a small pitch at The Grandstand. 4 names only, 3-hour PSI at 181. Best to cancel. I'll try again at East Coast next Thursday. For schedule threads put up tomorrow onwards, the price per player for up to the three most popular games will be increased by $1. If however, when the team selector poll closes, there are no players who put their names down in the first 72 hours left on waitlist, the $1 increase will reversed. For every game for which $1 extra is charged per player, a less popular game, or new game, will be reduced by $1. If a player who puts his name down for a game within 48 hours of the schedule thread going up (including having another player put his name down for him), and has a confirmed place the day before the game, withdraws on the day of the game, for the following week's game, no one else can put his name down in the first 48 hours after the schedule thread goes up, and he has to put his own name down for himself if he wishes to have his name put down within the first 48 hours. If this doesn't improve the situation, from November 2015 onwards, this may be extended to the following two weeks. I will also consider reducing the number of names each player can put down in the first 48 hours from 4 to 2 for the more popular games. To kick this off, I'll reduce the price per player for the game on Thursday, 8 October 2015, at East Coast, by $1, even though I haven't charged $1 extra for any game yet. HYFA @ Macpherson informed me that they use 150 as the threshold, so I will stick with that. I will also stick with the 3 hour PSI. To summarise, I'll cancel the game if the 3-hour PSI climbs above 150 in the hour before the game.&nbsp; If any player does not want to play if the PSI is between 100 and 150, please withdraw at least 5 hours before the game, otherwise, the usual penalties for late withdrawal will apply. The game on Monday, 14 September 2015, at Macpherson, with the 3-hour PSI at 167 at 7 pm, and 223 at 8 pm. The game on Monday, 28 September 2015, at Macpherson, with the 3-hour PSI reaching 261 at 6 pm, and most players deciding to cancel. The game on Tuesday, 29 September 2015, on a small pitch at The Grandstand, with the 3-hour PSI at 8 pm was 167. Although it had fallen from 230 at 5 pm, those living in the vicinity of the Grandstand said it was still pretty bad in that area. The game on Wednesday 23 September 2015, at Khalsa. The 3-hour PSI was 150 at 8 pm, but climbed to 178 at 9 pm, and was 194 by 10 pm. The game on Wednesday 30 September 2015, at Khalsa. The 3-hour PSI was 150 at 8 pm, but climbed to 178 at 9 pm, and was 194 by 10 pm. With some rain at 6 pm, 3-hour PSI fell to 168 by 8 pm, 176 by 9 pm, and 171 at 10 pm. We could have have gone on if the players had wanted to. I'm always prepared to wait until 8 pm to make the final call. If the 3-hour PSI is between 150 and 175 at 8 pm, I will leave it to the individual players whether they wish to go on. If enough players want to go on, the game can go on. Those who don't can drop out. If the 3-hour PSI is between 175 and 200 at 8 pm, I will suggest to the players that the game be cancelled. If enough players want to go on, I will not cancel the game, subject to the caveat that the players who want to go on should consider the conditions at the venue at before the game starts, and make a final decision then whether to go on. If they decide at that time to cancel, please let me know,so that I can cancel the booking too. I highlighted the above in the schedule thread for the game at Khalsa on Wednesday, 14 October 2015. A Wednesday regular conveyed his "disapproval" to me via WhatsApp. Amongst other things, he complained there had been no discussion. Well, the issue has been under discussion on the "Filling places & choices" thread since at least 20 September 2015. I'll postpone the introduction of any changes for now, so that there is more time for discussion. I also created "The price of popular games" thread on the "Introductions, Requests & Chats" board to allow for more discussion. The above quote is from the starting post to that thread. Anyway, I have postponed any price increase indefinitely. Although I am generally against playing with 3 teams over 2 hours, for now, I will try to get a second hour for any game that has the maximum number (7 for weeknight games at Macpherson and Khalsa and 8 for weekend games at The Grandstand) or more on waitlist within 48 hours, so we can play with 3 teams over 2 hours. The game next Monday (19 October 2015) at Macpherson got to 9 on waitlist within 12 hours, and an extra hour is available from 10 to 11 pm, so I will put up a poll on that thread from now until Sunday night to see if players are ok with playing with 3 teams over 2 hours. Thursday night at Khalsa, 9 to 10 pm, to deal with the excess on Wednesday night at Khalsa. I understand it was a good game last night, the first Thursday night game since 18 August 2015. Sunday night at Khalsa, 6 to 7 pm, to deal with the excess on Sunday evening at The Grandstand, and Monday night at Macpherson. I will start on 25 October 2015. Also, with immediate effect, for any game that has players on waitlist within 24 hours of the schedule thread going up, the maximum number of names each player can put down will be reduced to 2 for the following week. I hope that in time, players will find that the standard of our games converge, and will just go with availability. For any game that has players on waitlist within 24 hours of the schedule thread going up, for the following week, the maximum number of names a player can put down within the first 48 hours will be one other than himself. I tried this for the game scheduled for tonight (Monday at Macpherson), and Wednesday (28 October 2015) at Khalsa. It really didn't make much difference as to how fast the places filled up. Instead of one player putting names down for himself and three others, two of those four put names down for themselves and two others, a minor inconvenience. The greater inconvenience was to me, reminding players that they were not allowed to put four names down, and were limited to two. I will abandon this with immediate effect (starting with the schedule thread for the game on Sunday, 1 November, 2015, which will be put up tomorrow). My aim is to get a better mix between players who play the more popular games (Monday night at Macpherson, Wednesday night at Khalsa and Sunday evening at Grandstand) with those who are willing to play in the games I am trying to get going (Thursday night at Khalsa and Sunday night at Khalsa). I hope that if players get to know each other as a bigger GIFFA group, rather than just based on the game on particular day of the week at a particular venue, they will see that there are good players playing in every game, and the only real difference is familiarity, which is just a matter of playing together. For the system to be sustainable, I need to get to the point where players choose games based primarily on their availability, rather than who else is playing. For now, I spend, or will be spending, a lot of time asking around to fill up the Thursday night and Sunday night games. Sometimes, we're only a couple of players short, but it is hard to get those who put their names down for the more popular games on Monday night, Wednesday night and Sunday evening to come in to make up numbers for these games, even if they are on waitlist for the more popular games, and even with the $1 discount for the Thursday night and Sunday night games. As discussed above, putting up the price per player for the more popular games by $1 has been put on hold indefinitely. However, those who help me out by putting their names in for the Thursday night or Sunday night game deserve some greater benefit, other than just the $1 discount for those games. With effect from the schedule thread for the evening game for 1 November 2015 (to be put up tomorrow), in addition to the 2 places reserved for team selectors, in the first 48 hours after the schedule thread is put up for the more popular games (Monday night at Macpherson, Wednesday night at Khalsa and Sunday evening at The Grandstand), I will additionally reserve 2 places for players who put their names down for the Thursday night or Sunday night game scheduled to take place in the 7 days before that schedule thread is put up, and remain on the list until the game is played, or is cancelled (due to insufficient players, or any other reason). I tried the Sunday night game at Khalsa on 25 October 2015 and 1 November 2015, but there was no interest, so I did not continue. In any event, I wanted to focus on the Thursday night game. As we approach the end of the year, the games on Sunday evenings have not been filling up so well, with games struggling to get to 16 The Wednesday game at Khalsa still fill ups fast, but withdrawals the day before and on the day of the game has left me struggling to find replacements. Only the Monday night game continues to have players on waitlist right up to the line ups. Thursday nights have also become more popular, with a growing pool of regulars. For last night, with Imran and his colleagues playing for the second time since the re-start of the Thursday night game at Khalsa (the first time being two weeks earlier, on 12 November 2015), I didn't even have to ask around to fill up the places. In the light of the above, I will stop reserving places for players for those who play Thursday nights. Sunday night, 6 to 7 pm, at Khalsa (7-a-side). Tuesday night, 9 to 10 pm, at Sports Planet @ East Coast (5-a-side). Friday night, 9 to 10 pm, at The Cage @ Kallang (5-a-side). The extra Sunday night games is to see if those who are on waitlist or can't get in for the weekend games at The Grandstand, or the Monday night game at Macpherson, want to get a game on Sunday evening at Khalsa instead. A Sunday evening game at Khalsa also allows those who play at Macpherson or Khalsa on weeknights (Monday, Wednesday or Thursday), and who find The Grandstand too far away, an opportunity to play at the weekends. The Tuesday night game is currently at The Grandstand. It may be too far for those in the East. In any event, there are broadly separate pools of players for games at The Grandstand and games in the East. Further, the game on Tuesday night at Grandstand is 6-a-side, so we are limited to 12 places. The games on other days of the week (Saturday to Monday, Wednesday and Thursday) are all 7 or 8-a-side (14 to 16 places). An additional 5-a-side will give us 22 places for Tuesday night, covering more of Singapore (The Grandstand to the West and Sports Planet to the East). Give those left on waitlist for Monday a chance to play instead on Tuesday, also somewhere in the East. A lot of the players who used to play 7-a-side at Sports Planet @ East Coast have stopped playing, or do not play regularly anymore. While many don't want to play 5-a-side, hopefully, some of them aren't so fussy, and will come back. To finally have a regular Friday night game. To give those who miss the old Tuesday night game at The Cage a chance to re-live those games. Several of those who used to play Tuesday night at The Cage now play Tuesday night at The Grandstand. If they want to play a second game during the week, and are happy to go back to The Cage for the second game, the Tuesday/Friday split would work well. Not only does it make sense to me that these should be the three additional games I try for next year, these slots are also usually available. Anyway, these are the games I will play when I resume playing next year. For the game this evening (Sunday) at The Grandstand, increased up to 4 on waitlist, and finally 3 left on waitlist. For the game on Tuesday, 12 January 2016 at Grandstand (6-a-side), currently 6 on waitlist. For the game on Wednesday, 13 January 2016 at Khalsa, currently 5 on waitlist. It is surprising that despite having up to 53 players on waitlist for the 9 regular games from 4 January 2016 to 13 January 2016, I could not get more than 1 player for the extra game tonight, despite asking around extensively. Following on from the post above, I have decided to also schedule an extra 5-a-side game from 9 to 10 pm on Tuesday, 12 January 2016. As no pitch is available at Sports Planet, it will be at Macpherson. It should ordinarily be $10 per player, but as it is a new game, and to keep it at the same price per player as the regular Tuesday night game at The Grandstand, I will reduce it to $9 per player. If we continue to have large numbers on waitlist for our regular games, but there is little or no interest in the additional games I schedule to accommodate greater numbers, I will have to re-visit the issue of price per player. I will increase the price per player by $1 across the board for all games. For every game, I will reserve for a period of 24 hours after the schedule thread goes up 2 places for the team selectors or captains from the previous week's game, and 2 places for players who played in a less popular in the 7 days up to the day the schedule thread goes up. If there are places still available after 24 hours, the price per player will be reduced by $1. If there are places still available after 72 hours, the price per player will be reduced by a further $1. If there are places still available less than 3 hours before the game, any player coming in to fill up a place will pay a further $1 less. I aim to introduce this with effect from the game on 1 April 2016. With effect from the next game to be scheduled, the places to be reserved in each game will be as above. With effect from 1 March 2016, the number of names any player can put down within the first 24 hours will be limited to one other than himself. The problem of clustering persists. Starting from the schedule game for 1 February 2016, I will revive the system of reserving for 48 hours, in every other game, 2 places for players who play games that are slow to fill up (that is, not filled by the day before the game) or extra games, in the preceding week, in addition to the two team selectors. However, you still have to put your name down on the schedule thread as usual, and if more than 2 players claim the two places, between them, it will also be first come first in. It will suffice to qualify if the player concerned put his name down for game that was slow to fill up, or extra game, even if the game is ultimately cancelled, provided he remains on the list until the game either goes ahead or is cancelled. ..., the Tuesday game has only 12 places instead of the 14 or 16 for the other games, so if I allow up to 4 per player, 3 players could fill all the places. As such, I'll limit it to 3 per player for the Tuesday game, in the first 48 hours. Each GIFFA Player is limited to putting names down for himself and one other GIFFA Player. The first 4 places are reserved, two for the team selectors/captains from the game the week before, and two for players who make themselves available for a less popular game played or scheduled to be played in the 7 days before the expiry of the 24 hour period. 1. Each GIFFA Player can put a maximum of 3 GIFFA Players down inclusive of himself (1 more than in the first 24 hours). 2. No guests (non-GIFFA Players) can be put down. Additionally, after 48 hours, there is a maximum of 1 guest per player, until 24 hours before the game. Guests must be 18 or above in the current year. In the last 6 hours before the game, places are opened to any male aged 18 or above. In the last 3 hours, the age restriction is reduced to 16. Additionally, the restriction of 1 guest is now relaxed 24 hours before the game, not just 6 hours before the game. The restriction within the first 24 hours has taken effect today. Apart from the game on Tuesday, 1 March 2016, and the game next Tuesday (15 March 2016), every game scheduled since the start of the month (currently up to Wednesday, 16 March 2016) has had players on waitlist. Due to withdrawals (4 for the game on 2 March 2016 and 4 for the game on 9 March 2016), no one was left on waitlist for these games. Even the less popular Thursday games had players left on waitlist, 1 for the game on 3 March 2016 and 3 for the game on 10 March 2016. 5 left on waitlist for the game on Saturday, 5 March 2016, at The Grandstand. 5 left on waitlist for the game on Sunday, 6 March 2016, at The Grandstand. 6 left on waitlist for the game on Monday, 7 March 2016, at Macpherson. Currently 4 on waitlist for the game tomorrow (Saturday, 12 March 2016), at The Grandstand. Currently 3 on waitlist for the game on Sunday, 13 March 2016, at The Grandstand. Currently 6 on waitlist for the game on Monday, 14 March 2016, at Macpherson. Going forward, the most sensible way to accommodate the surplus of players for the weekend and Monday games is to try to get the extra game at Khalsa on Sunday night going. Next week is school holidays, so people may be away. The Sunday after is a long weekend for Easter/Good Friday. I will resume scheduling this extra game on Sunday from the following weekend onwards, that is, 3 April 2016. As set out above, those who come in to play in less popular games are given priority for all games in the following week. To be clear, "Less popular games" are not fixed by the day or venue. They are based on how fast any game fills up, and how difficult it is to get to the maximum number. "Less popular games" means any game that has not filled up within 48 hours of the schedule thread being put up, that still has one or more places available, or that become available, on the day of the game itself, and does not at any time have any player on waitlist. Going forward, I will refer to such game as "slow filling games" rather than "less popular games". To be clear, for slow filling games, I will add a statement to that effect with the line ups. So that those who have been playing on Tuesdays and Thursdays believing them to be fixed as "less popular games" don't lose out, the Tuesday and Thursday games played this week (8 and 10 March 2016 respectively) will be counted as "less popular games". ...., HYFA @ Macpherson has its put its prices up by 10% with effect from 15 February 2016. I will bear the increase until 1 April 2016. It will be $11 per player from April 2016 onwards. .... Going forward, the most sensible way to accommodate the surplus of players for the weekend and Monday games is to try to get the extra game at Khalsa on Sunday night going. Next week is school holidays, so people may be away. The Sunday after is a long weekend for Easter/Good Friday. I will resume scheduling this extra game on Sunday from the following weekend onwards, that is, 3 April 2016. The extra Sunday game will be $9 per player. Players have to make their own choices. Apart from the Monday night game at Macpherson, I will postpone the $1 across the board increase until later in the year. Since February 2016, the restriction on putting names down for others has been stricter in the first 24 hours than in the first 48 hours. In particular, in the first 24 hours, each GIFFA Player can only put a name down for one other GIFFA Player. This is not the same as putting names down for two GIFFA Players. However, players who are not playing continue to put names down for 2 other GIFFA Players. This is especially so for the Wednesday game. In such a situation, the second player loses the first 24-hour priority, unless one of the two is entitled to a reserved place. Likewise, when a player puts three names down (himself and two others), the third player loses first 24-hour priority, unless one of the two others is entitled to a reserved place. The player who loses first 24-hour priority is still entitled to the first 48-hour priority. For the schedule thread from 1 October 2016 onwards, I have made this clearer. No guests are allowed in the first 48 hours. After 48 hours, there is a maximum of 1 guest per player, until 24 hours before the game. Guests must be 21 or above in the current year. In the last 6 hours before the game, places are opened to any male aged 18 or above. In the last 3 hours, the age restriction is reduced to 16.&nbsp; The GIFFA Player adding a guest under 21 years of age shall be responsible for the guest. All GIFFA Players are presumed to be sufficiently familiar with "The GIFFA System" and the "Playing Rules &amp; Principles" threads.&nbsp; Guests should be provided with salient information contained in those threads by the GIFFA Player adding his name. The Sunday game at Grandstand is struggling, cancelled last week (9 Oct 2016) with only 4 players, and withdrawals for today's game leaving us with 11, only enough for a game on the small pitch, and not enough willing to play on a small pitch. To make matters worse, the new manager at the Premier Pitch @ Grandstand is very sticky with cancellations less than 48 hours before the game. Further, I will be very busy for the rest of this month, up to 6 November 2016. In the circumstances, I will not be scheduling a Sunday game at The Grandstand until 13 November 2016. When I resume the game on 13 November 2016, it will be from 4 to 5 pm, in accordance with the current state of the poll. For the three Sundays in between (23 Oct 2016, 30 Oct 2016 and 6 Nov 2016), I will schedule a game at Khalsa from 6 to 7 pm. At least the manager at Khalsa does not give me grief if I cancel very late. For the Sunday game at Khalsa, we had 8 players for 23 October 2016. 30 October 2016 was the Deepavali weekend, so I didn't make any effort to try to fill the game. Apart from the Sunday night game at Grandstand not filling up, the Saturday game at Grandstand has been relatively slow to fill up for a few weeks now. Further, for several weeks now, the weeknight games have been filling up better than the weekend games. The Sunday night game at Khalsa is intended to provide more places for those who play the weeknight games. I will continue to schedule the Sunday night game at Khalsa until the end of November 2016. Premier Pitch @ The Grandstand now inform me that the 4 to 5 pm slot is not available on Sunday for 13 and 20 November 2016, so I will keep it at 5 to 6 pm for those two weeks. However, if the game has not reached the minimum number by Friday, I will cancel the game. The Sunday evening game at Grandstand will resume from 13 November 2016 onward, at the usual time slot, 5 to 6 pm. Also to accommodate more players for the weeknight games, I am prepared to consider switching the Tuesday night game from a small pitch to a big pitch in the new year, even if that means having to bring the game forward an hour to 8 to 9 pm. I have added a poll to that effect. The game fills up quickly, within 24 hours of the schedule thread being put up, with several players already on waitlist. After the WhatsApp group chat is created the day before the game, there are several withdrawals, sometimes leaving us short a few hours before the game. To me, it looks like the same old problem of hogging/"choping" and clustering. What makes it worse if that we are left short on the day of the game, players who might otherwise have been able to play, and might have put their name down if the waitlist had not been so long in the days before the game, are no longer available. There is a serious issue here. At least once, it has left us to go on with the minimum number. Previously, it had resulted in a Monday night game being cancelled. The player will have to pay a $1 admin fee (Option A - $1 admin fee). The player will not be allowed to put his name down within the first 24 hours of the schedule thread being put up for the same game in the following two weeks (Option B - 2 week restriction). I will let the players decide which option will be implemented. I have added a poll above, and moved this thread from the "Introductions, Requests & Chat" board to the "Stand-Alone Polls" Board. The poll will close on 31 December 2016 and the outcome will apply to all schedule threads put up from 1 January 2017 onwards. There was a late withdrawal for the game today (Sunday) at The Grandstand. With less than an hour to go before the game was due to start, I was asked whether any late replacement could be given a discount. $1 penalty for withdrawals after the team selector/captain poll closed (usually 5 hours before the game). $2 penalty for withdrawals less than 3 hours before the game. $3 penalty for withdrawals less than 2 hours before the game. $4 penalty for withdrawals less than 1 hour before the game. Half the price per person for withdrawals less than half an hour before the game. The price per person less $3 for a no show with good reason given. The price per person less $2 for a no show with some reason given. The price per person less $1 for a no show with no reason given. If a player has to withdraw late, but either personally confirms with the first player on waitlist that the player on waitlist is able to take the withdrawing player's place, or, if there is no one on waitlist, finds his own replacement, the penalty will be reduced. If not less than half an hour before the game, a player offers up his place to those on the waitlist, I will not treat it as a withdrawal, as long as the player remains available if no one on waitlist is still available. At least $3 if he confirms his availability half an hour or less before the game is due to start. $2 if he confirms his availability an hour to half an hour before the game is due to start. $1 if he confirms his availability two hours to an hour before the game is due to start. We managed only one game over the Chinese New Year period, on Saturday, 28 January 2017, the usual evening game at The Grandstand. We struggled to get to a 7-a-side. The games on Sunday and Monday (yesterday) had no names down, and the game tonight has been cancelled with only 2 names down. For Chinese New Year, numbers do not pick up until after the 15th day of the Chinese New Year (Chap Goh Mei). For February 2017, I will only schedule the Sunday evening game at The Grandstand, as "flexi-time", and I won't schedule the Sunday night game at Khalsa. If we get to 16 each Sunday in February 2017 without requiring a great deal of effort on my part, I will resume the Grandstand bookings in March 2017. The Tuesday game has been struggling for a few weeks, cancelled on 24 January 2017 and 31 January 2017 (perhaps due to the Chinese New Year period), then struggling to get to 10 on 7 February 2017 and 14 February 2017. There are new 7-a-side pitches at Woodleigh Road (the Arena, near the junction of Bartley Road and Upper Serangoon Road). At it is very central, I will look into it further. Subject to availability, I am considering moving the Tuesday game to the Arena. Filling the game this Tuesday (21 Feb 2017) on a small pitch at the Grandstand was very frustrating. Every time we got to 10, a player withdrew. We were finally stuck on 9, and the game was cancelled. I will move the Tuesday night game to the Arena off Bartley Road. No pitch is available next week, so it will commence on 7 March 2017. For the Sunday game on a big pitch, if we do not have enough players by Friday night, I cancel the booking. If we subsequently have enough players, I check to see if the pitch is still available. For the Tuesday game on a small pitch, I only make the booking if we have enough players. I don't want to hold too many bookings that may not be used in the end. For the Sunday game, as there is only one big covered pitch, and it is more likely to be taken by others, I keep the booking as long as possible. For the Tuesday game, as there two small covered pitches, and they are less likely to be taken by others, I only make the booking when we have enough players. However, for this Tuesday (25 April 2017), by the time we had enough players on Tuesday itself, the small covered pitches were not available. There was no uncovered small pitch on the other side (Premier Pitch outdoor). However, Premier Pitch indoor has a small uncovered pitch which was available. It is smaller than the other 5-a-side pitches, only suitable for 4 or 5-a-side. The game went ahead on the that pitch. It was $8 per player. The small covered pitch is not available for the next 2 weeks, so we'll stick with the same uncovered pitch. While it means we can't go up to 6-a-side, it means we can go ahead 4-a-side. As we've been struggling to get even to 10 over the past few weeks, it sort of makes sense. Currently, GIFFA Players have priority over guests in the first 48 hours after each schedule thread goes up. A guest is anyone who has not registered or has not played in our games before. Tim C queried this today in relation to tomorrow's game. The distinction between approved players and guests is becoming more important. Approved players can put their names down for any game, and subject to certain limitations, can also put names down for other approved players and guests. Conversely, approved players should be familiar with the values, principles and rules by which our games are played and the broad range of issues relating to our games, or at least make some effort to become familiar with these matters. The separation of guests first took place in September 2009. At that time, it was more a matter of administration and mode of communication. Increasingly, it is the difference between being part of a community and a visitor/guest. The priority system also seeks to address the issue of "clustering", where players rush to put names down for more popular games, while less popular games take longer to fill up. This creates several administrative issues, the most disruptive of which is players "choping" places in more popular games and then ending up with several withdrawals on the day of the game itself. What I need to impress on players is that as long as they are flexible, there will always be a place available in one game or other, which was how this entire concept got started in the first place. The game on Monday at Macpherson is scheduled as a 7-a-side on a big pitch. The game this Monday (13 Nov 2017) was changed to a 5-a-side due to several withdrawals after the WhatsApp group chat was created on Sunday. Although for some time now, the Monday night game at Macpherson has been the fastest to fill up, usually with several players on waitlist within the first 24 hours, withdrawals after the WhatsApp group chat is created has been a persistent problem. Game changed leads a few times. Whites lead 3-1, the. Reds lead 6-3 then 8-5 and went further to 12-5. Then the whites turned up a notch and scored 7 to make it 12-12. Faisal ran his heart out and was spotted squatting and panting for breath 2 to 3 times. 5v5 is constant non stop and not much space to move the ball. Good workout for all but common consensus is most did not enjoy 5v5. I can understand things happen but clearly, it is impossible to search at such late notice players. And these friends pay full price. I suggest that in the event that such things happen, late pull outs should pay for the game if it turn out 5v5. If managed to remain 7v7, friends brought in should pay half and half compensated by late pull outs. I seriously will not play 5v5 in future. Not enjoyable for me imo. And I have played it twice in such situations. The payment is for the pitch, not for the organisation of games. Where the venue threaten to require payment for a late cancellation, who is to pay? Those who withdraw? If we don't have enough because of 3 late withdrawals for example, do they each pay $40 each? If there is a risk of having to pay $40 for having to withdraw unexpectedly, why would anyone want to put their names down? I might as well not schedule the game at all. It is easy to complain, not so easy to find a solution, especially if those concerned are uncompromising. Go ahead on a smaller pitch, if one is available, and there are sufficient players for the smaller pitch. If due to withdrawals in the 48 hours before a game, we are left short, then cancelling the game at such a late stage carries the risk of having to pay for the pitch anyway. Currently, only HYFA @ Macpherson and Premier Pitch @ Grandstand threaten to require full payment if we cancel less than 48 hours before the game. Premier Pitch @ Khalsa does not. If we have at least the minimum number when the group chat is created, but as a result of withdrawals, the game is cancelled, those who withdraw after the WhatsApp group chat is created will have to share any cancellation fee payable for the venue, unless they find their own replacement. If there is no cancellation fee payable, they will still have to pay a $1 admin fee. Withdrawals include anyone stating a condition for playing which was not stated before the group chat was created, for example, they only want to play with the maximum number. Any loss of priority will apply to next week's game. Fortunately, 10 players are willing to go ahead on a small pitch, and a small pitch is available. I've reduced the price per player to $9 per player. Additionally, I will reserve places for the 10 for 48 hours for next week's game. Team selectors are Andy and Ray. Line ups to follow. We had 11 players left after Reuben brought in his friend, but Tim C refused to play 5-a-side on a small pitch. Fortunately, we still had 10. If we had had to cancel, it would have been very difficult to apportion any cancellation fee between those who withdrew or refused to play in the last 48 hours. There has to be a lot more give and take for our games to be sustainable. "Give and take" is part of being an adult - the ability to reach an accommodation, and to stand up and be counted when other people are relying on you. It is easy to say I only want A, and nothing else. What if A is not available, but a reasonable alternative is? Do we react like a spoilt child and walk away, saying we don't want to participate at all? Our games are for adults - it's in the name - "Generic Indoor Football For Adults". If a game on a smaller pitch is too frenetic or tiring, there are simple tweaks we can make to improve the game, such as requiring the goalkeeper to stay within the D, or taking a half time break. Players are free to contribute ideas on the forum, and selectors/captains are free to try out modifications during any game. All it requires is some intelligence. It makes more sense to find a practical solution, rather than to just complain and walk away. It is also more adult. Provide those who are available to go ahead with the game with fair and reasonable incentives, such as reduced payment and priority for the following week, for participating in a game which has been hampered by withdrawals after the WhatsApp group chat is created. Provide those who withdraw after the WhatsApp group chat is created with fair and reasonable disincentives, such as payment of an admin fee, and loss of priority the following week. For the game last night at Grandstand, which is usually scheduled as a 5-a-side, we were left with 8 due to withdrawals after the WhatsApp group chat was created. Stuart didn't want to play 4-a-side, so we tried to get 2 more. Frederic mistakenly put his name in, believing it was a game on a big pitch. When he realised his mistake, and also realised the game couldn't go on without him, instead of petulantly withdrawing or refusing to play, he got a friend in to make 5-a-side. That is the way adults behave, and I am grateful. In effect, the players only pay for the pitch. If a group of players just had a pitch, they could do with it as they pleased. The games themselves take a lot of organisation, which I don't charge for. If I charged for the time I spend organising the games, it would easily cost players twice as much. That is what I give, for free. If all any player wants to do is to take, but give nothing back (other than pay for the pitch, which he can anyway do on his own account), please go away, I don't have time for you. From next Monday onwards, for games at venues that threaten to charge for late cancellation (see above), where we are left short of players for a big pitch due to withdrawals in the 36 hours before the game, but a smaller pitch is available, and there are sufficient players for a game on a smaller pitch, the game will go on on the smaller pitch. Any player who withdraws because he does not want to play on a smaller pitch will be treated as a late withdrawal. The results of each game will be added to a table, 2 or 3 points for a win, 1 point for a draw. I've added a poll. I will switch to this if at least two-thirds of those vote are in favour of switching. If there are insufficient votes, then we will stick to the usual format, with the first 16 names. The poll will close at noon tomorrow. WhatsApp group chat created. I have added the players on waitlist for now, so that they are updated as well. The poll is currently 9-2 in favour of playing with 3 teams over 2 hours. To give more players the opportunity to vote, I will extend the poll until 5 pm today. Those who haven't voted yet, please vote. The option of staying at the Premier Pitch (5 to 7 pm) remains. I have just locked the poll. It is 10:4 to switch to three teams over two hours. 5 to 7 pm at Premier Pitch (covered). 4 to 6 pm at Rainforest (uncovered). To be radical, there is a further option, 4 to 5 pm at Rainforest (uncovered) and then continue 5 to 6 pm at Premier Pitch (uncovered). However, this means moving from one venue to the other, which might take about 10 to 15 minutes. However, if the 6 to 7 pm slot at Premier Pitch is not taken, we can make the time up there, beyond 6 pm. Further, as there is no discount in having 2 hours at Rainforest, it will still work out to $15 per player. I will put all three options to a vote. This time, most votes will decide which option. The poll will close at midnight. As there are three options, I will allow 2 votes per player. For those who were adamant they only want to play the usual 5 to 6 pm at Grandstand, in the spirit of Christmas, don't just think of yourself. Anyway, as I said a couple of times on the group chat, I cannot please all of the people all of the time. I have locked the second poll. The result is below. I will amend the first post above accordingly. I have added the team captain poll. As there are 3 teams, each player has 3 votes. I have included everyone who has played at least 15 games over the current 6 month period or 50 games over the past 3 years, and has not specifically opted out as captain. I will discuss teams with the 3 team captains after noon tomorrow. The 3 team colours will be red, white and black. Playing with 3 teams over 2 hours has been suggested several times over the years, but mainly by newer players or players who don't play so regularly. Our regular players are used to our format of two teams playing flat out for an hour without breaks or substitutions, and are not keen to switch to 3 teams over 2 hours to accommodate more players in our regular games. With 22 players in total (including those on waitlist), and the pitch being available from 5 to 6 pm (in addition to 4 to 5 pm), I asked on the WhatsApp group chat if anyone would be interested in playing 3 teams over 2 hours as we did on New Year's Day. The first 3 responses (from Christian, Ben B and Anthony) were against the idea. With no one coming out in support of the idea, I won't waste time pursuing the idea. Friday, 19 Jan 2018, 8 to 9 pm, at Macpherson. Sunday, 21 Jan 2018, 6 to 7 pm, at Khalsa. The high volatility for the Monday night game at Macpherson is unacceptable. Too many players are either just putting their names down to "chope" places, or putting their names down without sufficient commitment to play. I cannot be cancelling games at Macpherson on the day itself, with the management there repeatedly reminding me that I am required to give at least 2 days' notice for cancellations, and that I will have to pay for the pitch if I cancel late. We need more players who are committed to play, and can do without players who just want to reserve a place until they decide what they really want to do on a Monday night (after the weekend), including perhaps playing in some other game that is not confirmed until Monday itself. ... for the Monday night game at Macpherson, when it is reintroduced in March 2018, I will reduce the price per player to $10 per player for at least a month, but apart from any other admin fee or penalty, there will be a $1 admin fee for anyone withdrawing after the WhatsApp group chat is created on Sunday. We got to 14 for the Monday night game at Macpherson on 12 February 2018, with several players introduced directly or indirectly through Ray Yap and Reuben Ong. It was good to have new players who were committed to play. I will switch the Macpherson game next week from Friday (2 March 2018) night to Monday (26 February 2018) night. I intended in any event to resume the Monday night game at Macpherson the following Monday (5 March 2018), which means the resumption of the Monday night game will start a week earlier. No names were put down for the extra games. As always, extra games require me asking around, and I haven't had the time. I will not schedule the extra games (Friday night at Macpherson and Tuesday and Sunday night at Khalsa) until after the March 2018 school holidays, which ends on 18 March 2018. Continuing from the thread above, the Monday night game at Macpherson has been filling up well since July 2018, regularly reaching 5 or more players on waitlist within a day or two of the schedule thread being put up. Although with withdrawals, the waitlist dwindles, we have not been left short of players. I have been considering having a second weeknight game at Macpherson. The only day where a pitch is available at our regular weeknight time slot of 9 to 10 pm is Tuesday. Further, Tuesday night is the only weeknight where we don't have a 7-a-side game. The Tuesday night game at Grandstand had been switched from a 5-a-side on a covered pitch to a 6-a-side on an uncovered pitch from July 2018 onwards, but it has this month been switched back to a 5-a-side on the covered pitch. There were 10 players on waitlist for the game next Monday (19 November 2018) within a day of the schedule thread going up on Wednesday (14 November 2018). I will additionally schedule a Tuesday night game at Macpherson for the rest of this month (20 and 27 November 2018) to see if there is sufficient interest. Since several of those who play Monday night at Macpherson also play Wednesday or Thursday night at Khalsa, I will delay the schedule threads for the Wednesday and Thursday night games by a day for the rest of this month, to give time for the additional Tuesday night game to sink in. 3 December 2018, with up to 7 on waitlist. 10 December 2018, with up to 6 on waitlist. Even after 2 withdrawals, we have 9 players on waitlist for this 7-a-side game on Monday night at Macpherson. We also have 8 players on waitlist for the 7-a-side game on Wednesday night at Khalsa. The 7-a-side pitch is available from 9 to 10 pm on Tuesday, 8 January 2019. If we get a Tuesday night game at Macpherson going, everyone has more choice, and more players get to play. I will create a WhatsApp group chat with all the players who put their names down for the games on Monday and Wednesday to discuss the issues. I quoted the above post on the schedule thread for the Wednesday night game at Khalsa (9 January 2019), and created the WhatsApp group chat shortly after, with all the players who put their names down for Monday and Wednesday included, even those who had withdrawn. The discussion on the group chat showed that the reluctance to try new games was primarily due to the concern of playing with unfamiliar players, which meant the standard of play was unpredictable, and the balance of teams harder to achieve, especially when the Thursday night game at Khalsa, with a higher turnover of players, is taken into consideration. My counterpoint is that we are talking about the same 50 or so regulars, with another 50 or so less regular players making up the numbers for each game. If enough players who played Monday, Tuesday and Thursday tried out a Tuesday night game at Macpherson, they would soon find it was the same group of players playing. Once we reach that level of comfort, everyone who have more choice of which day to play, and more players who want to play get to play. Sunday, 6 Jan 2019, at Grandstand, up to 4. Monday, 7 Jan 2019, at Macpherson, up to 11! Today (Tuesday, 8 Jan 2019, at Grandstand, up to 2, even after switching the game from a 5-a-side on a small covered pitch to an 8-a-side on the big covered pitch. Wednesday, 9 Jan 2019, at Khalsa, up to 8. Thursday, 10 Jan 2019, up to 3. Saturday, 12 Jan 2019 (which went up yesterday), up to 6, so far. That is 31 places on waitlist, even after increasing the number of places by 8! The big pitch at Grandstand is not usually available on Tuesday nights, but when it is, we can consider switching from a 5-a-side to an 8-a-side, to create more places. However, generally, the Saturday, Monday and Wednesday games fill up very fast (within 24 hours of the schedule thread going up), while the Sunday, Tuesday and Thursday games fill up much slower, only a day or two before the game (3 or 4 days after the schedule thread goes up). The real issue in sustaining less popular games and getting a new game started is familiarity with other players. To increase familiarity within the group, for the rest of this quarter (up to 31 March 2019), I will schedule an extra game on Tuesday nights at Macpherson, and those who put their names down for any of the games on Sunday, Tuesday or Thursday, and do not subsequently withdraw, will have priority in the first 24 hours for the Saturday, Monday and Wednesday games. Basically, by giving those who play in the less popular games a better chance of playing in the more popular games, we increase familiarity between players. I will review at the end of the quarter. The regulars for the games on Saturday, Monday and Wednesday are in any event prepared to compete for limited places for those games, while those who put their names down for the games on Sunday, Tuesday or Thursday largely just want to get a game, so no one is seriously prejudiced, some players benefit short term, and there is long term benefit for everyone. What may be referred to as a no-lose, win-win situation! The priority will apply to those putting their names down for a game on Sunday, Tuesday or Thursday scheduled to take place in the 7 days up to and including the day the schedule thread for the Saturday, Monday and Wednesday game goes up, commencing from the schedule thread for 16 January 2019. I will also put up the schedule thread for the additional game on Tuesday at Macpherson a day earlier (on Wednesday), commencing from 9 January 2019, for the additional game on Tuesday, 15 January 2019. Continuing from above, the Monday night game at Macpherson and the Wednesday night game at Khalsa continue to fill up fast, with several players on waitlist within a day on the schedule thread going up. For example, for this week, we had 9 on waitlist for the game on Monday (25 March 2019) and 12 on waitlist for the game today (Wednesday). For both games, there were a remarkable number of withdrawals after the WhatsApp group chat was created. The Monday night game at Macpherson has had at least 9 on waitlist for a few weeks now, reaching 11 for the game on 11 March 2019. The Tuesday night 6-a-side game at Grandstand, and the Saturday evening game at the Grandstand, also fill up well, within 2 or 3 days of the schedule thread going up. The Sunday evening game at Grandstand has struggled to fill up. The game on 3 March 2019 was cancelled, while other games in recent weeks have only filled up on the day itself. For last Sunday (24 March 2019), we were stuck on 8 until the morning of the game itself. I expect numbers for the weekend games are down because of two factors: (i) people travelling at the weekends and (ii) the wide range of 11-a-side leagues in full flow, with games played at the weekends, mainly on Sunday. The Tuesday night game at Macpherson continues to struggle. We managed a game last week (19 March 2019) only because no pitch was available for a 5 or 6-a-side at Grandstand, so we instead had Grandstand regulars versus Macpherson regulars at Macpherson. The Thursday night game at Khalsa also continues to struggle, with the games on 14 February 2019 and 7 March 2019 cancelled due to lack of numbers, and the game last week (21 March 2019) cancelled due to players not being keen to play following heavy rain in the afternoon/evening, after we had struggled to get numbers in the first place. Those who remain available for the games on Tuesday night at Macpherson and Thursday night at Khalsa will have priority in the first 24 hours after the schedule thread goes up for the next games on Monday night at Macpherson and Wednesday night at Khalsa. Those who remain available for the Sunday evening game at Grandstand will have priority in the first 24 hours after the schedule thread goes up for the next games on Saturday evening at Grandstand Tuesday night at Grandstand. Those who remain available or the game on Tuesday night at Macpherson will have priority in the first 24 hours after the schedule thread goes up for the next game on Tuesday night at Grandstand. Players can put their names down for both Tuesday night game, indicating their preference against their name. Further, I have not been imposing the $1 administrative fee for the Monday and Wednesday night games for those who withdraw after the selector poll is put up. 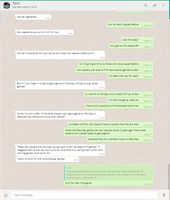 For April 2019, if the number of players on waitlist is no less than 7 within 24 hours of the schedule thread being put up, and remains no less than 7 when the WhatsApp group chat is created the day before the game, anyone who had a confirmed place at the time the WhatsApp group chat is created, and then withdraws after the selector poll is put up, will have to pay a $1 admin fee, apart from any late withdrawal penalty for withdrawing less than 5 hours before the game. I will review towards the end of April 2019.